So then, whatever I decide to do for next year Golden Demon has to be bigger, better painted, better planned, more colourful and generally the mutt’s nut’s. Easy then! Now in reality I probably spent a total of three ‘average’ months on my model (i.e. 12 weeks) – I reckon I put in a but under 90 hours work in total. So lets reckon I have 45 weeks with which to do things before the next Golden Demon (giving me 7 weeks for things like Christmas, leaving home, holiday, etc) – that’s between three and four times the amount of time, putting in 7.5 hours worth of work for each of those 45 weeks – 330 hours in total. I should be able to force in extra time over this period as well. What this does put into perspective is that I need to ensure that whatever I choose to do is realiastic. If I can spend 90 hours and not actually finish a dreadnought, then I don’t want to do a entry that has four heavily converted dreadnoughts and a vindicator in. I’m going to presume that the categories aren’t going to be any different than they were this year, although there is the potential to change I think that it is highly unlikely that this will happen. Now I personally don’t think that there is any point in entering the single miniature or squad/unit categories. These are some of the most hotly contested categories in the whole competition, plus I am concious that I could loose interest if I plough on down this road. This leaves vehicles & monsters, dual and diorama (leaving out lotr). I’m currently verging on the concept of a diorama of some kind. It having a substantial ‘modelling’ element (building/feature) with a handful of miniatures interacting. What I wouldn’t want to do is have two models fighting each other – which is what there seemed to be quite a bit of this year in cabinets. I’d also want to make it as close to the 30cm cube as possible – the winners this year all seemed quite small. 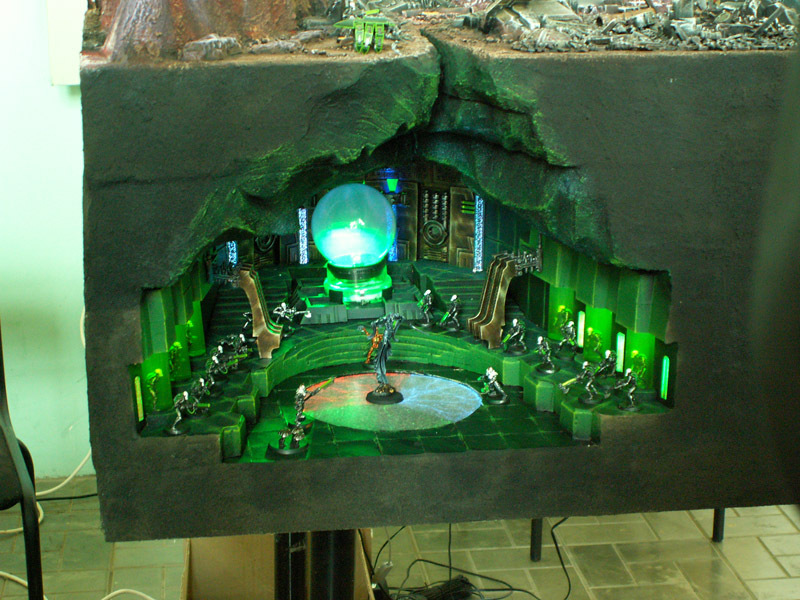 Of course one thing to remember is that a diorama doesn’t have to have any fighting element to it. Another idea is that there was a concept sketch of a Space Marine Dreadnought that looked brilliant – basically more like the old fashioned Dreadnought, but much more modern and with more armaments on. Now although I realise that the key element of any entry is the painting, I don’t want to have too many miniatures that require intricate and fine detail’s painted on. My free hand isn’t that great and I actually dislike large scenes that are festooned with intricate detail as it’s largely lost in the background.